Just last year, scientists announced they had spotted a planet orbiting the star nearest our sun, Proxima Centauri. Today, they're fleshing out the neighborhood with the announcement that they've found a ring of cold dust circling the star. That may not sound particularly impressive, but it's actually a big deal, because it suggests there might be other planets waiting to be found—perhaps even a whole solar system. The discovery is described in a new paper accepted for publication in The Astrophysical Journal Letters. "It’s the first indication of the presence of an elaborate planetary system, and not just a single planet, around the star closest to our sun," lead author Guillem Anglada, an astronomer at the Institute of Astrophysics of Andalusia in Spain, said in a press release. "This result suggests that Proxima Centauri may have a multiple planet system with a rich history of interactions that resulted in the formation of a dust belt." 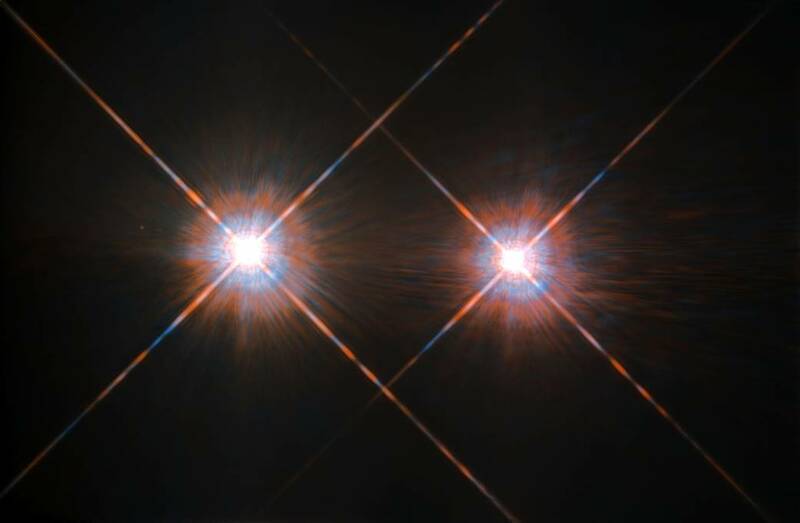 This NASA/ESA Hubble Space Telescope has given us this stunning view of the bright Alpha Centauri A (on the left) and Alpha Centauri B (on the right), shining like huge cosmic headlamps in the dark. The image was captured by the Wide-Field and Planetary Camera 2 (WFPC2). WFPC2 was Hubble’s most used instrument for the first 13 years of the space telescope’s life, being replaced in 2009 by Wide-Field Camera 3 (WFC3) during Servicing Mission 4. This portrait of Alpha Centauri was produced by observations carried out at optical and near-infrared wavelengths. Scientists discover Earth-like planet Proxima b :Does the nearest star to our solar system host worlds of its own? 2016 could be the year we find out, as the nearby red dwarf star Proxima Centauri gets scrutinized by astronomers in unprecedented detail using a variety of search methods. One of the most exciting is the Pale Red Dot initiative. Led by the European Southern Observatory (ESO) scientists, Pale Red Dot is a public campaign to examine Proxima Centauri for exoplanets using the radial velocity method, which looks to tease out the signal of an orbiting planet tugging on its host star. 51 Pegasi – the first exoplanet discovered orbiting a Sun-like star in 1995 – was discovered using this method, and hundreds of discoveries that followed.